A collection of ecosystems sharing similar climatic conditions, like tundra, tropical rainforest and desert. A biome has distinctive abiotic factors and species which distinguish it from other biomes. Water, insolation and temperature are the climate controls important when understanding how biomes are structured, how they function and where they are found round the world. Biomes usually cross national boundaries and do not stop at a border. Explain the distribution, structure and relative productivity of tropical rainforests, deserts, tundra and any other biome. 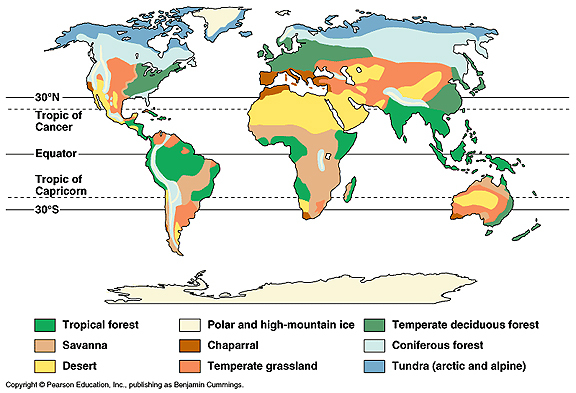 In IB however it is required that you need to be able to explain the distribution, structure and relative productivity of tropical rainforests, deserts, tundra and one other biome.Climate should only be explained in terms of temperature, precipitation and insolation only. In this picture you can see where each biome is located.